V-STAT Advanced Scar Gel is the only topical gel that is proven as an effective prophylaxis against hypertrophic scar formation. 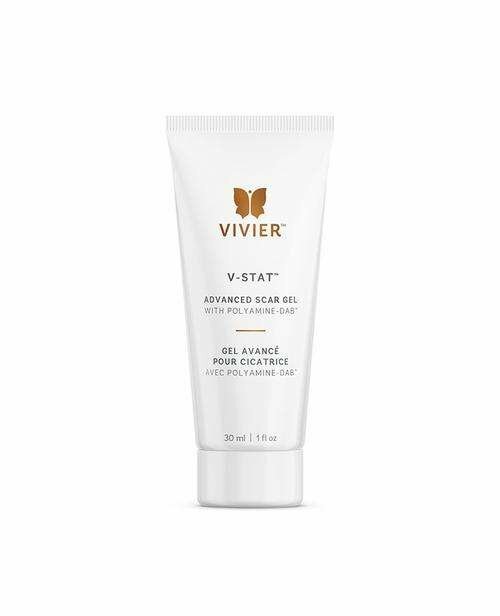 V-STAT Advanced Scar Gel minimizes the appearance of new scars and repairs dry skin with 0.8% Polyamine-DAB, a polyamine that plays an important role in the healing and aging process of the skin. The role of this polyamine was discovered by a Plastic Surgeon backed by 30 years of research and 6 patents filed on this molecule. A randomized prospective double-blind clinical trial was conducted on 56 patients using 0.8% Polyamine-DAB on scars following breast reduction surgery.